Putting your child up for adoption can be one of the most difficult choices to make in life. While many pregnant mothers are excited at the gift of a new life, others may be worried about providing the best upbringing for their little one. Placing your baby for adoption should be seen as one of the biggest declarations of love, placing the life of your newborn into the arms of welcoming strangers. Before making a decision, it can help to ask yourself a few questions surrounding the adoption process and what it entails for your family. A is 4 Adoption strives to be a better option over any adoption agency in California, delivering a personalized plan to create the best outcome for you, your baby, and the adoptive parents. Our adoption center works hard to cut through the uncertainty and long wait times associated with adopting a baby. 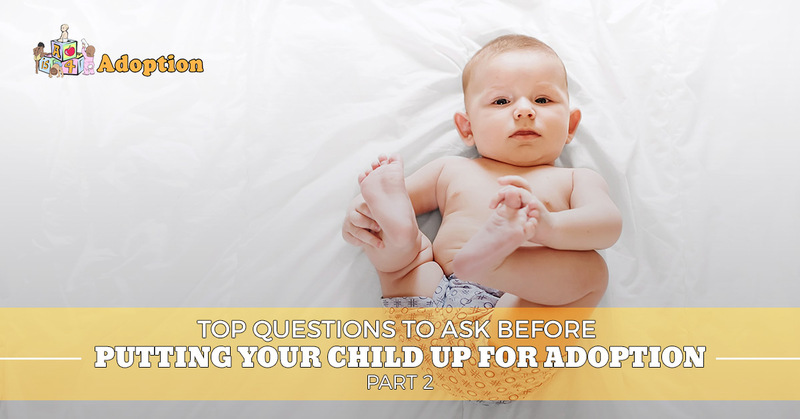 Today, we’ll look at additional questions that may help you in deciding whether or not to place your baby for adoption. Be sure to contact our Costa Mesa location to learn more! Will my child be able to know that I put them up for adoption out of love? Usually yes. Our wealth of resources on domestic adoption help prospective parents to understand what the biological mother is going through, and will be very helpful in aiding them in explaining why adoption happened for their child. Beyond this, many adoptive parents will have the choice in how much you can communicate with your offspring. While every situation is different, many families benefit from the open adoption process, where contact between both parties is encouraged. You as the mother will be able to relay to the new parents your wishes, and some parties will be able to conduct video calls or even visitations to check on the welfare of the child. Will I receive counseling services while going through the adoption process? Yes. Learning about your pregnancy may have lead to feelings of stress, isolation, and more. These feelings can be very normal for a pregnant woman regardless of her situation, and it’s important to find a source for emotional support and clarity on many of the complicated facets surrounding pregnancy and adoption. Being able to talk through complex emotions and find a suitable answer is one reason why A is 4 Adoption offers quality counseling services and referrals to our birth mothers. Will I receive support to help me throughout the pregnancy? Definitely! Our adoption center prides itself on offering comprehensive birth mother help, delivering every resource we can to keep your health and finances up to speed. Beyond quality counseling services, A is 4 Adoption is able to assist with food, transportation, and housing needs to ensure that everything is up to speed during your pregnancy. Our experts will also be able to coordinate health care needs, from appointments for ultrasounds to working with hospital staff to ensure the best possible outcome. Need more support? Our adoption representatives will be there for you from start to finish. From the initial phone call to being by your side in the delivery room, we’ll do everything in our power to minimize the stress and help to produce a very positive outcome for you and the adoptive parents. Taking the time to make the best decision for your unique situation is highly recommended. As California’s adoption professionals, we are here support you every step of the way throughout this difficult process. Putting your child up for adoption may be incredibly hard, but it can prove to be the best choice for the life of your child. Unlike a standard adoption agency in California, A is 4 Adoption works personally with clients to create a fast, effective plan that works to put infants in need into the arms of qualified, loving families. Contact us today to learn more about our birth mother support!